The TOPS program is designed to provide transportation to medical appointments and to facilitate rides to other destinations such as the pharmacy and grocery store. This program is available to adults age 60+ who reside in the Senior Services North Fulton service area – Alpharetta, Johns Creek, Milton, Mountain Park, Roswell and Sandy Springs. Transportation provided by: CaraVita Home Care, Common Courtesy, Inc., Senior Helpers of Alpharetta, and Senior Solutions Transportation, each under contract to Senior Services North Fulton. Who is eligible: Seniors age 60+ in the Senior Services North Fulton service area: Alpharetta, Johns Creek, Milton, Mountain Park, Roswell, and Sandy Springs. For those with significant vision or other physical limitations, the service can include a 1-on-1 feature, where someone stays with them. The 1-on-1 service is currently not available for seniors who need an electric wheelchair lift. Destinations: Medical appointments and other trips in the Greater Atlanta area. Rides must originate at the client’s home in North Fulton. Cost: No cost, but a voluntary contribution of $10.00 one way or $20.00 per round trip, to help fund the program, is invited. Pleases note, the ability to contribute is not a requirement to receive this service. Frequency: Contact the Program Manager. Lead Time: Up to one month in advance, but no less than 72 hours, prior to the requested pickup time. Like to hear more? Click here. 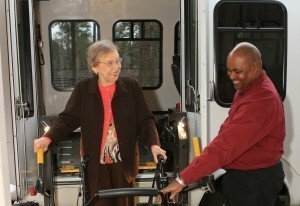 Transportation is available for registered Senior Center participants to and from our four Senior Centers in Crabapple/Alpharetta, Milton, Roswell, and Sandy Springs. This transportation service picks up seniors at their homes in the morning and returns seniors to their homes after lunchtime. Destinations: To our Senior Centers and back, Monday-Friday. Cost: There is no cost, but voluntary donations are accepted at the Senior Centers for programs and activities. For information and service please contact the Senior Center closest to you.